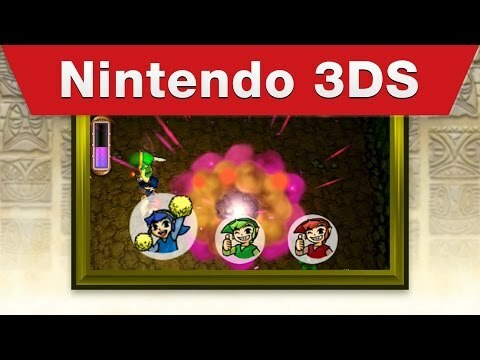 The Legend of Zelda: Tri Force Heroes for Nintendo 3DS family systems is the latest title in The Legend of Zelda series. In this entry, three Links have to work together in co-operative multiplayer to find their way through various levels filled with traps and puzzles. All three players share hearts, so they must work together to defeat enemies and solve puzzles! Three players, controlling one Link each, help each other on the adventure by stacking themselves together into a ‘Totem’ to reach higher areas, changing into different costumes which give unique abilities to match the level, or simply by using different items. Team up with two other players in multiplayer mode via local wireless connection, online* and with Download Play**. Choose from a set of emoticons to communicate with each other while playing in the three-player multiplayer mode. Or play in single-player mode, where you can rent 'dolls' to complete your team of three and face challenges in dungeons!